Evaluative metering +1 stop: 1/5 sec. at f/16. This past weekend, I spoke at the NFRCC annual meeting. 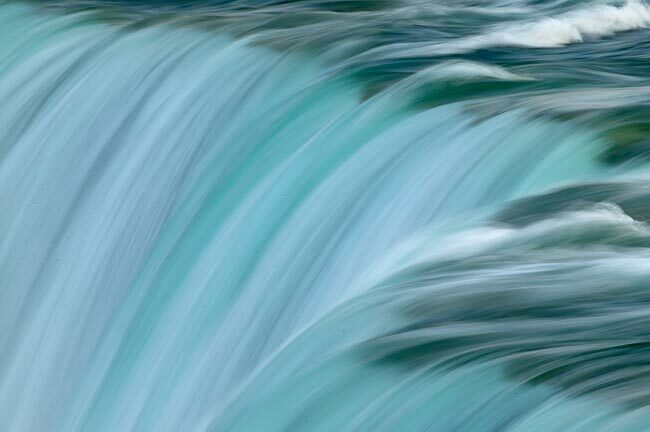 When I mentioned to a colleague of mine (who happens to be Canadian) that I had been having fun photographing the falls in the cloudy conditions, he stated that he had often photographed the falls in a variety of "better" lighting conditions and had, therefore, left his gear home. When I showed him this image, he said, "Ooooooh, my, my. That is very nice." This image was inspired in part by images from Brenda Tharp's book (see below). Mastering Digital Photography and Imaging, Peter Burian. Hot off the press, Peter's new book is the perfect reference for folks either considering switching to or just getting started in Digital Photography. The book is divided into three sections, Essential Digital Imaging Equipment, Capture, and Optimizing Images. Each chapter is chock full of helpful tips and suggestions. Just about every digital-related topic under the sun is covered, and covered well. Peter's explanations of technical matters are easily understood because of his clear concise writing style. The text is amply illustrated with Peter's fine images and many well-chosen screen-captures. Do know that Peter is a good friend who has made a career evaluating new camera equipment for many prominent publications and is also the co-author of the popular National Geographic Photography Field Guide. Canon EF 500mm f/4 L IS lens with 2X II TC and EOS 1Ds digital camera. ISO 250. Evaluative metering +1/3 stop: 1 /640 sec. at f/8. When I approached this very tame bird with five of the photographers in my group, I did not expect that we would be able to make any outstanding images as the bird's bill looked pretty pathetic... As is often the case, however, magic occurred as soon as we put our tripods down. 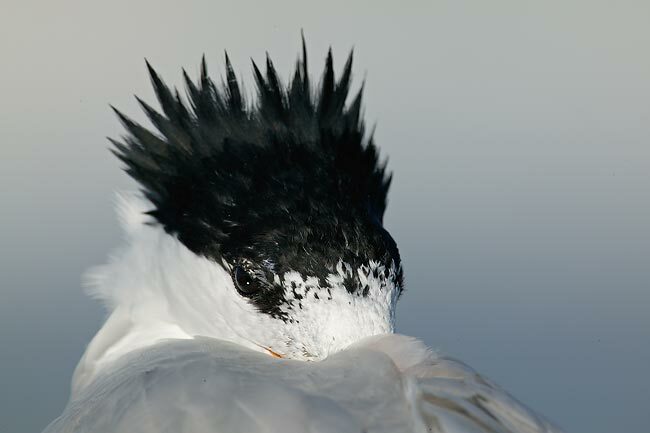 The wind picked up and began to blow that bird's crest all over the place for more than ten minutes. Each time that he yawned we were presented with a superb opportunity. Note that when the sun is partially obscured by a cloud and you have white against blue, you need to add a bit of light (rather than subtract a bit as you would with the sun at full strength). I have a single slot open for anyone wishing to join me this weekend (MAR 13-14) for one or two days of personalized instruction at Fort DeSoto just south of St. Petersburg, FL. Please e-mail or call (863-692-0906) ASAP for details. Over the past few months, I have received many e-mails from folks aghast that their EOS 10D camera bodies would not autofocus with certain lenses when they were used with this or that teleconverter. It is time to clear up the confusion once and for all. The Canon EOS 10D was designed to autofocus only at effective apertures of f/5.6 or larger (and the same is true of the A2 series and Elan series camera bodies as well as of the Digital Rebel). When you use a 1.4X teleconverter, you lose one stop of light and reduce the effective aperture of you lens by one stop as well. With the 2X TC, you love two stops of light and likewise reduce the effective aperture by two stops. Therefore, when you use a 1.4X TC with an f/5.6 lens or a 2X TC with an f/4 lens, the effective aperture is f/8 and AF will not function. All Canon camera bodies that feature 45 point AF are designed to autofocus (with the central AF sensor only) at effective apertures wider than f/8. Thus, if you use a 1.4X TC with an f/5.6 lens or a 2X TC with an f/4 lens, AF will function with these camera bodies (EOS 3, 1v, 1D, 1Ds, and 1D Mark II) as the effective aperture is f/8. Do note that only the central sensor will be active. If you are interested in the more detailed explanation supplied by top Canon tech-rep Chuck Westfall, please request the "Canon AF Function with TCs" file via e-mail. Canon EF 500mm f/4 L IS lens with 1.4X TC and EOS 1Ds digital camera. ISO 250. Evaluative metering +1 2/3 stops set manually: 1/60 sec. at f/5.6. Fill flash with Better Beamer at -1 stop. To see a spectacular portfolio of co-leader Todd Gustafson's Kenya images, click HERE. 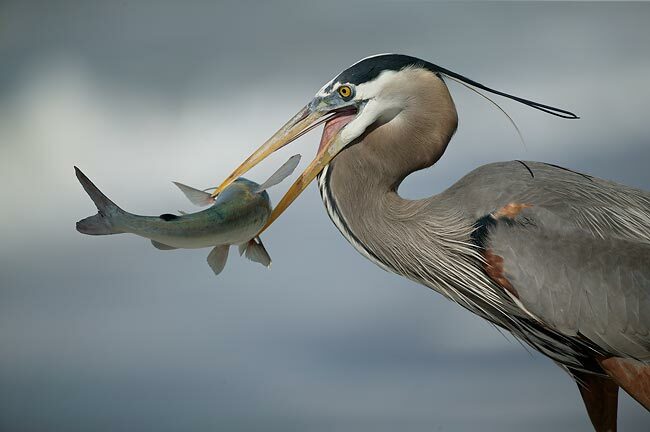 Great Blue Heron with catfish, Blind Pass, Captiva, FL. Canon EF 500mm f/4 L IS lens with the EOS 1Ds digital camera. ISO 250. Evaluative metering -1/3 stop: 1/4000 sec. at f/4.0. The June 2004 Nome IPT is once again sold out. Fort DeSoto/Sarasota, FL IPT: 3-DAY ($829) MAR 26-28, 2004 is also sold out. The St. Augustine Alligator Farm, FL IPT: 3-DAY ($829) APR 23-25, 2004 has six openings. The Point Pelee Warbler IPT: 3-DAY ($829) MAY 9-11, 2004 has six openings. The Magee Marsh, Toledo, OH Warbler IPT: 3-DAY ($829) MAY 14-16, 2004 is wide open. Bosque Del Apache NWR, NM. Geese and cranes. 3-day IPTs ($849) NOV 21-23 and NOV 27-29. 2004. Ellen Anon will be co-leading both of these trips with me. (Limit: 14) Both of these IPTs are beginning to fill. Canon EF 500mm f/4 L IS lens with 2XII TC and a 25mm extension tube borrowed from Al Forns. EOS 1Ds digital camera. ISO 250. Evaluative metering -1/3 stop: 1/640 sec. at f/16. Here's another image made while the group was standing around on the beach chatting. In this case, I tried to lead by example. When working at point blank range, I try to use some extra depth of field to insure front to back sharpness of the subject. Here I used One-Shot AF to focus on the eye and then recompose. Click here to enjoy the SW-FL IPT Experience. THESE ARE MY BREAD & BUTTER CAN’T MISS IPTs: HERONS, EGRETS, GULLS, TERNS, SHOREBIRDS, OSPREY, BURROWING OWL & BOTH PELICANS. SPOONBILLS LIKELY. 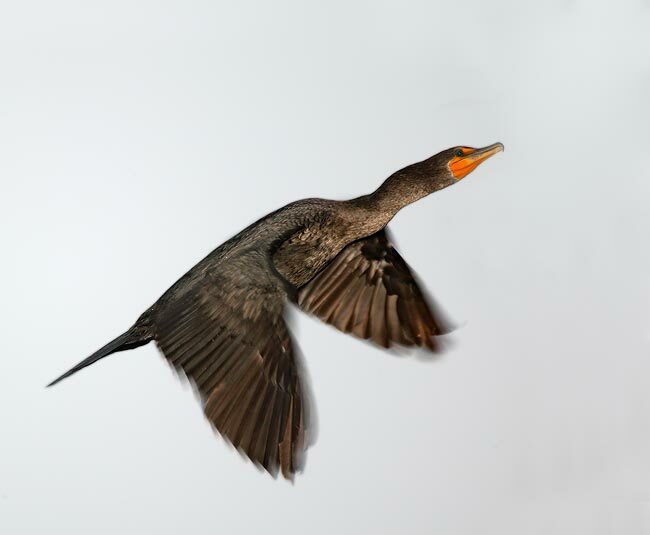 FIND OUT WHY FOLKS COME TO FLORIDA TO PHOTOGRAPH BIRDS! 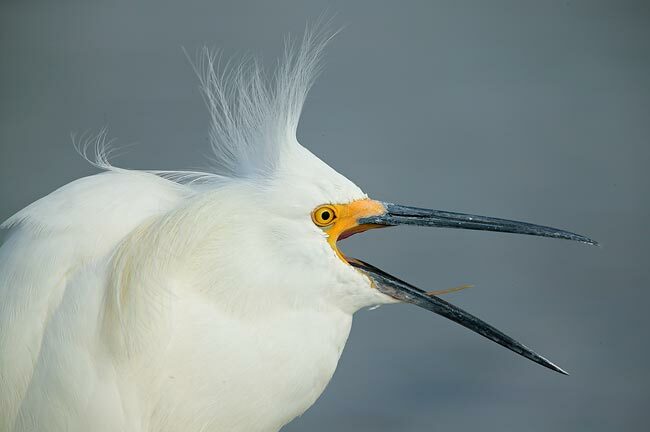 WE WILL VISIT DING DARLING NWR, SANIBEL ISLAND, PLACIDA, THE VENICE ROOKERY, CAPE CORAL, AND LITTLE ESTERO LAGOON. Click here to enjoy the San Diego ITP Experience. CALIFORNIA BROWN PELICANS IN SPECTACULAR BREEDING PLUMAGE, BRANDT'S (& OTHER) CORMORANTS, WESTERN, CALIFORNIA, HEERMAN'S--ALSO IN SPECTACULAR BREEDING PLUMAGE, & OTHER GULLS. 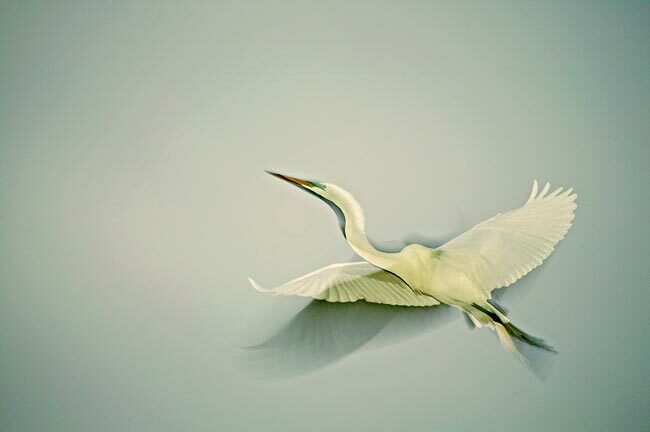 (WE WILL HAVE INCREDIBLE FLIGHT PHOTOGRAPHY OPPORTUNITIES WITH ALL OF THE ABOVE SPECIES). LESSER SCAUP, WOOD, RING-NECKED AND OTHER DUCKS. MARBLED GODWIT, WILLET, WHIMBREL, SURFBIRD, WANDERING TATTLER & OTHER SHOREBIRDS, EVERYTHING AT CLOSE RANGE! HARBOR SEALS & SEA LIONS. DEPENDING ON LOCAL CONDITIONS, WE MAY BE TEMPTED TO MAKE THE EARLY MORNING TRIP TO BOLSA CHICA LAGOON. Canon EF 100-400mm IS zoom lens (handheld) with the EOS 1Ds digital camera. ISO 400. Evaluative metering +1 2/3 stops off of the sky set manually: 1/8 secl at f/5.6. Flash effectively as main light at -1 1/3 stops with Better Beamer and Arca-Swiss Wimberley Flash Bracket. This image was made while it was still pretty dark... In these conditions, digital is extremely sensitive to flash, thus I noted quickly (by checking out the image on the LCD screen) that flash at -1 1/3 stops acted as main light and illuminated the bird completely. Since I had set the ambient exposure to +1 2/3 stops, the sky was kept relatively light toned in the converted file--I darkened it in Photoshop. In any case, with the slow shutter speed I knew that I would produce a flash blur--the white bird is the flash exposure, the shadowy grey wings are the ambient exposure. Now that I am using digital and am free to experiment, folks on the SW FLA IPTS have to get up earlier than ever!